Toyota Verso prices revealed | What Car? 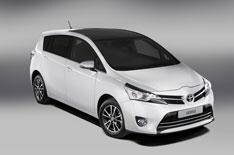 The 2013 Toyota Verso will cost from 17,495 when it arrives in the UK this January. The face-lifted Verso comes in five- and seven-seat versions, with three engines on offer. Toyota is offering 1.6-litre and 1.8-litre petrols as before; the 1.6 available with a manual gearbox, and the 1.8 with the Multidrive automatic transmission. The 2.0-litre diesel engine has been revised, with CO2 emissions cut by 10g/km to sub-130g/km levels. Toyota is offering three trims: Active, Icon and Excel. The entry-level Active model comes with electric front windows, air-conditioning, daytime running lights, hill-start assist, and USB/aux connections. Icon adds 16-inch alloys, a leather-trimmed steering wheel and gearknob, Bluetooth, rear electric windows, rearview camera, dual-zone climate control, cruise control and a DAB digital radio. Excel trim adds larger alloys, leather seat bolsters and door trims, keyless entry and start, automatic headlights and wipers, and roof rails. The top-spec Excel with the 2.0-litre diesel costs 23,445. The Active 1.6 petrol is the only model available with five seats, while all the other engine and trim combinations come with seven seats. The rear seats can be dropped to the floor thanks to Toyotas Easy-Flat folding system. Options include Toyotas Touch and Go sat-nav system (650), a panoramic sunroof (550) and an Appearance Pack, which brings bi-xenon headlights, LED daytime running lights and roof rails (700). The new Verso is available to order now, with deliveries from mid-January 2013.